Personalized Note Cards – A Giveaway! I’m a complete and total stationary junkie. I love the stuff. I mean, office supplies in general can get me pretty excited, but stationary? Yes, please. And personalized stationary? All the better. That’s why I’m beyond excited about the latest giveaway here on Curiouser and Curiouser. It’s for — you guessed it! 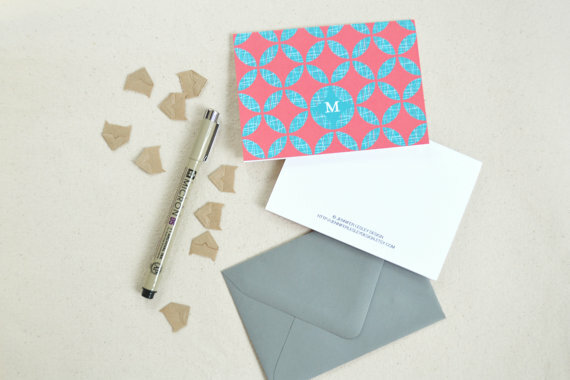 — personalized stationary, crafted by the talented Jennifer Lesley of Jennifer Lesley Design on Etsy. In addition to note cards, Jennifer’s Etsy shop contains other handmade items like home decor, tea towels, and personal accessories such as sunglasses cases and bookmarks. Jennifer (a Savannah College of Art and Design grad who currently lives in Atlanta) strives to create items that people will truly enjoy and make a connection with. Materiality is an important aspect of the objects she creates because it is the biggest opportunity for the user to make a personal connection; it may come from the smell of leather, the feel of a heavy canvas, or the soft texture of wool felt. The personalized stationary sets were born as a way to showcase some of Jennifer’s repeat-pattern work that didn’t quite work as a pillow or a tea towel. Having these patterns featured on note cards gives the added benefit of being able to customize each set to add a personal touch. Follow Curiouser and Curiouser via Bloglovin’. By AnnaIn Giveaways & ContestsTagged jennifer lesley design, jennifer lesley design etsy, personalized note card giveaway6 Comments on Personalized Note Cards – A Giveaway! Previous Previous post: My Birthday, And A New Header! Done and Done! Mshell loves personalized note cards!